Deliquescence refers to the property of a substance to absorb water from the air to dissolve itself and form an aqueous solution. Materials with this property are termed deliquescent. Deliquescent materials are a class of hygroscopic substances. Other types hygroscopic materials may absorb water, yet not dissolve. In order to be deliquescent, a substance must both absorb a large amount of water and be sufficiently soluble to dissolve in it. Most deliquescent substances are salts. Examples include sodium hydroxide, potassium hydroxide, ammonium chloride, gold(III) chloride, sodium nitrate, and calcium chloride. 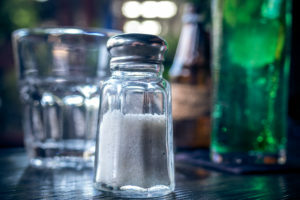 While table salt or sodium chloride (NaCl) may be deliquescent if the particles are small and the humidity is very high, salt is usually considered to be hygroscopic. Because of their affinity for water, deliquescent substances find use as desiccants. They may be used to remove excess water from sulfuric and phosphoric acids. In the chemical industry, deliquescent chemicals are used to remove water from chemical reactions. ← Who Is the Father of Chemistry?